Go from Vilnius to Lvov on our comfortable Eurolines Business Class buses! Planning the trip is really easy, as we go to Lvov every day. Choose our new buses and enjoy the comfort of Eurolines Business Class. * Please note that the Internet quality depends on the geographical position of the bus. Wi-Fi may be unavailable at certain locations. Your trip from Vilnius to Lvov will fly by while you enjoy the latest movies and music at our Media Center. Movies. Our Media Center offers a wide variety of movies, from romantic comedies to action movies, dramas and cartoons. Music. Enjoy your trip with the grates hits of SEL, Kings of Leon, Markas Palubenka, Ed Sheeran and many, many more. E-magazines. Enjoy a variety of e-magazines during a long trip. 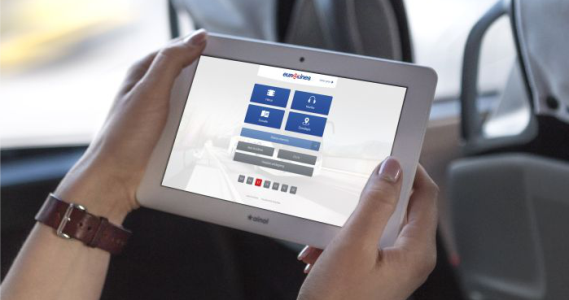 Once you are on the bus, connect to our free Wi-Fi and enter media.eurolines.lt in your browser. You will be automatically connected to our Media Center. You can use your smartphone, tablet or laptop to connect to the Media Center and use its services free of charge during the entire trip. Good news for all our loyal customer! You can now travel with Eurolines and save! Purchase three international Eurolines tickets and get the fourth ticket at half price! All you need to do is present three Eurolines boarding card stubs at our ticket office at the bus terminal or travel agency, or send their electronic copies at info@eurolines.lt, and you will get your fourth ticket to Lvov at 50% off! Read more about our Loyalty Program. Purchase a family ticket and ride the bus to Lvov with your family at 40% off. Family ticket is available to a group of 3-6 people, including 1-2 adults and at least one minor child under 18 years of age. You can take two children under 7 for FREE. The third and fourth child under 7 years of age will get a 50% discount. Tickets for children between 7 and 10 years of age will be discounted by 50%. You can purchase family tickets for all routes marked with the family symbol . Purchase a return trip for the Vilnius – Lvov – Vilnius route and get your return ticket at 10% off. Plan your trip by bus ahead and pay less when you return from Lvov.